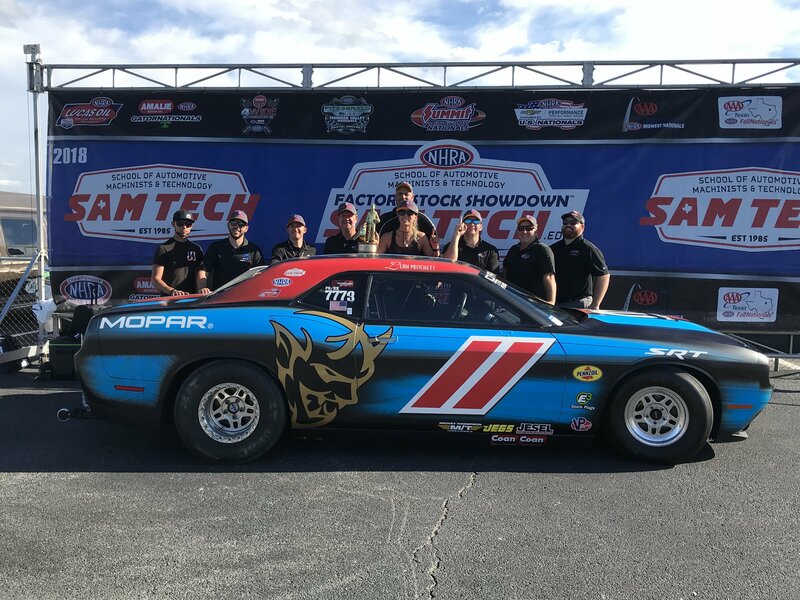 MADISON, Illinois (September 23, 2018) – Mopar Dodge Challenger Drag Pak driver Leah Pritchett continued to own the Factory Stock Showdown class, celebrating her second consecutive event win one day after becoming first in the class to run in the seven-second range during the AAA Insurance NHRA Midwest Nationals at Gateway Motorsports Park near St. Louis. "Incredible weekend by the ‘el Bandito’ team with Mopar," said Pritchett who moved up to the No. 2 spot in the FSXX standings. "We carried that momentum from the U.S. Nationals without a hiccup. That extra 25-pounds didn't seem to faze this Mopar power. I'm not saying it was easy by any means. We put it to it every single round and that's extremely impressive and a testament to the durability of the race cars, the powerplant and the people that Schumacher has put in place to run this program. "We are in a fantastic spot, second place in the points. It's like Christmas Eve going into these last races. I really wouldn't want a different perspective. We have a little bit of freshening up to do but overall this has been an incredible weekend of just straight teamwork all the way around, and the Mopar power just continues to show through and we continue to want to show up." 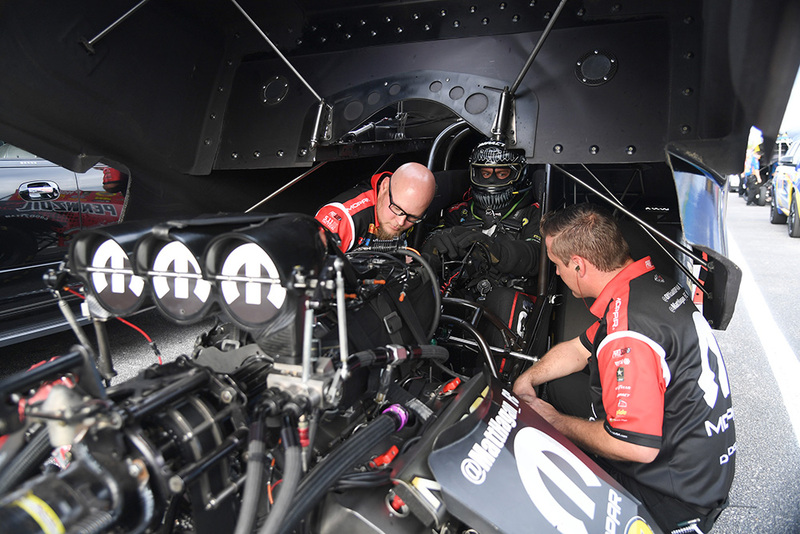 The winningest NHRA Mello Yello series driver in Gateway Motorsports Park history qualified in the top half of the field to match up against Doug Kalitta in round one of eliminations on Sunday morning. Kalitta’s 3.792-second pass was no match for the three-time Top Fuel world champion’s session-best 3.727-second winning run. Against his round two opponent Clay Millican, Brown was first out of the gate but Millican pulled ahead near the 330-mark and never trailed, ending Brown’s chances at picking up a sixth St. Louis trophy. Brown and the Matco Tools/U.S. Army team enter the next event rounding out the top half of the Top Fuel standings, sitting in fifth. Leah Pritchett was the last DSR Top Fuel driver standing Sunday, tying her career-best Countdown result by reaching the semifinals. She was on a solo run in round one when a broken throttle cable on her opponent Scott Palmer’s machine ended his day before the run. 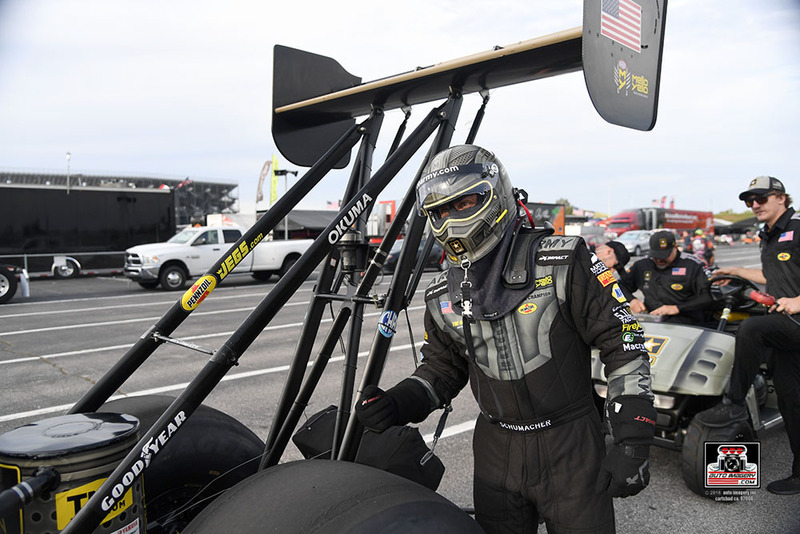 Blake Alexander was the seven-time Top Fuel winner’s next opponent, and the two met for the fourth time this season. Pritchett had the starting line advantage and never trailed with her run of 3.802 seconds at 322.73 mph. In the semifinals, Pritchett gave it her best effort to take down the points leader, Steve Torrence. 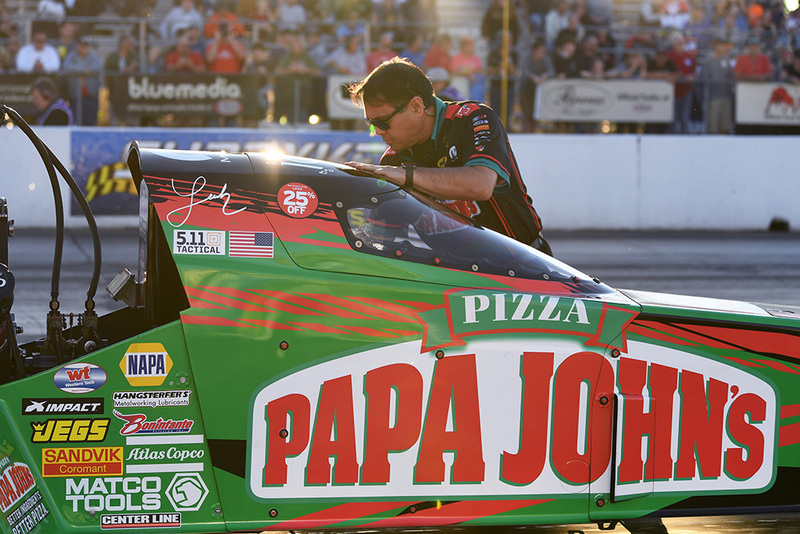 The Papa John's Pizza pilot had a slight advantage at the start, but Torrence powered around her and took the win with his pass of 3.772 seconds compared to Pritchett’s 3.809 E.T. “Going to the semifinals in the Countdown against some of the stiffest competition is definitely nothing to hang our heads about. We weren’t the quickest or fastest this weekend, but we made great improvements. We made wholesale changes that we had to commit to, and there was no turning back. We nipped away at them, but it just wasn’t quite enough. Tony Schumacher entered his 500th event with his sights set on advancing from second to the No. 1 spot in the Top Fuel points ranking. Schumacher qualified his Mike Neff/Phil Shuler-led U.S. Army dragster sixth for race No. 2 of the Countdown to the Championship and drew non-Countdown contender Richie Crampton in round one. “The Sarge’s” 11,000-horsepower machine lost traction near halftrack before giving way to an engine explosion, but Schumacher was able to hang on for the win against Crampton’s tire smoking attempt. In round two, Schumacher had the starting line advantage but early tire smoke allowed his opponent Pat Dakin to claim the upset win. 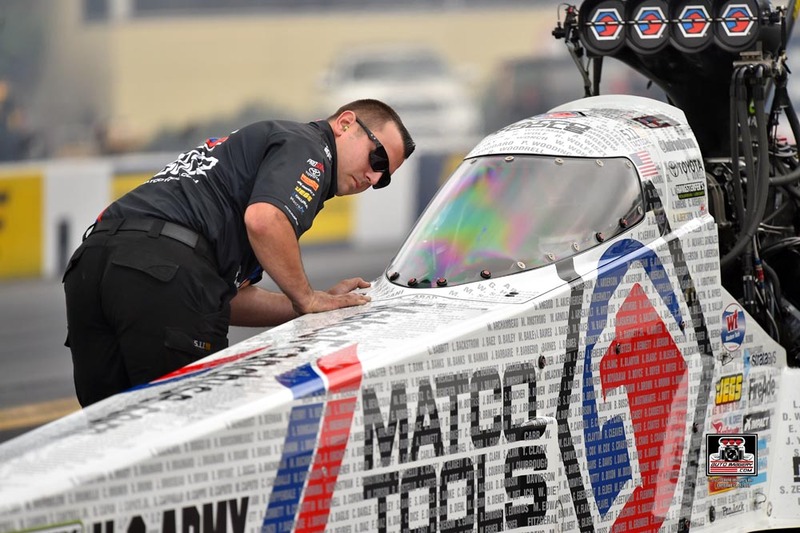 Schumacher leaves St. Louis ranked third in the Top Fuel standings. Two-time St. Louis winner Jack Beckman, driver of the Infinite Hero Foundation Dodge Charger SRT Hellcat, qualified in the top half of the field in the eighth position, drawing John Force in the opening round. “Fast” Jack quickly put his Hellcat’s nose out front and began to add to his lead before his momentum abruptly came to a halt around the 600-foot mark due to a broken blower drive shaft, allowing Force to drive around for the win. Beckman is now ninth in the standings. 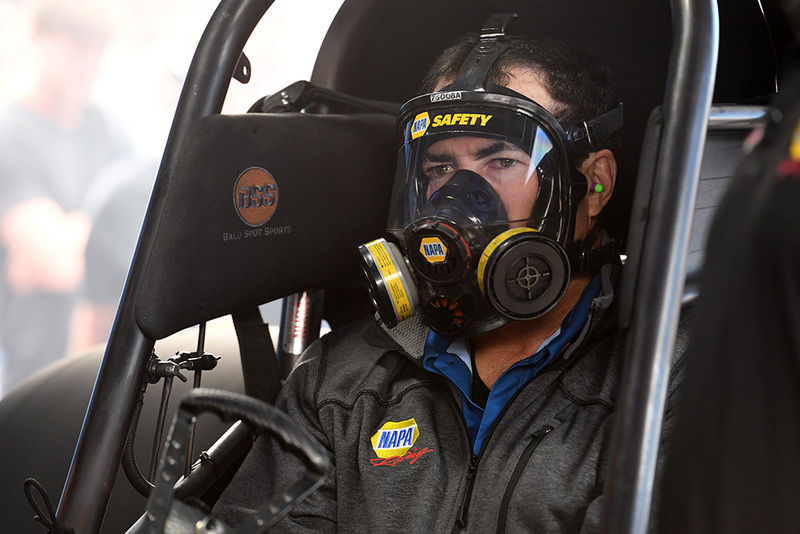 Defending event champion Ron Capps returned to Gateway Motorsports Park looking to add to his category-best four NHRA Midwest Nationals Funny Car titles. Capps and the NAPA AUTO PARTS team were nearly flawless throughout qualifying, making the second quickest run of each round and earning bonus points during all four sessions. The 2016 Funny Car world champion’s 3.873-second Q4 pass, which held up to be the second quickest E.T. of the event, enabled Capps to start from the No. 2 position on race day. 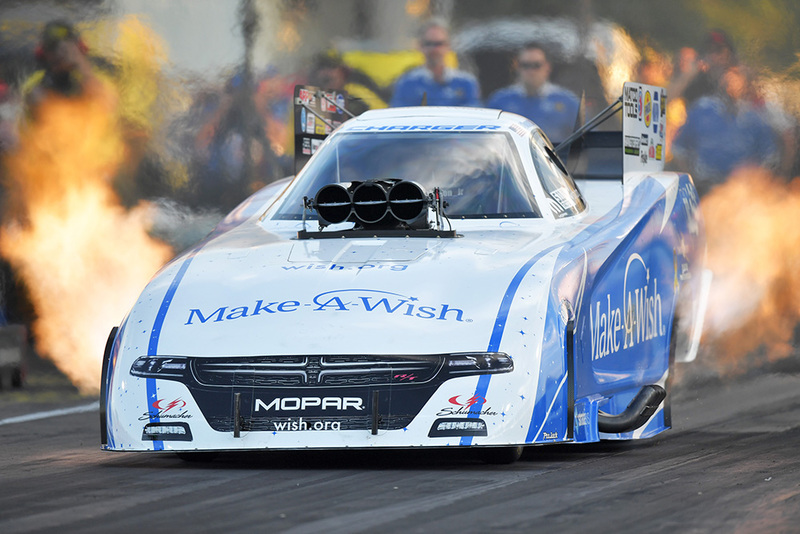 Capps’ round one matchup found him squaring off against ‘Countdown spoiler’ Cruz Pedregon. Capps powered the NAPA AUTO PARTS Dodge cleanly down the track in 3.978-seconds, but his opponent’s starting line advantage (0.067 vs. Capps’ 0.101-second reaction time) enabled Pedregon to claim the holeshot round win. “We talked about these non-Countdown cars being dangerous. They have a lot to prove and nothing to lose. Like I said at driver intros, you can’t take a driver and team like that lightly. Cruz has won two championships. “I didn’t feel like I missed the light. Sometimes, as a driver, you feel like you didn’t hit the light as good as you normally do. I try to be consistent. The worst part is that it hurts so bad because we had the best car on the ground. We were so consistent and good in qualifying with (crew chief Rahn) Tobler and this NAPA AutoCare team. Run after run, in different conditions, we ran great. "We had a really good car. We're doing really well in the Countdown, it's just that Robert Hight is becoming a real pain, but that's a good motivator. I feel the four best cars in the Countdown were in the semis and I'm glad we're one of them. We just need to pick it up one more notch and I think we'll be the car to beat." Mark Pawuk made the second official sub-eight second run to reset the national FSXX E.T. record and qualify No. 1 in his Empaco Equipment Mopar Dodge Challenger Drag Pak. The Pro Stock driver turned Factory Stock Showdown shoe’s top seed awarded him with a Bye run in the opening session of eliminations. In the quarterfinals, Pawuk faced Stephen Bell. The drivers were nearly even leaving the starting line but Bell moved to a slight lead early into the run and maintained his pace for the round win, ending Pawuk’s day early.